Brachytherapy Alone: A variety of doses have been successfully used by various centers. In order to give some guideline to the individual practitioner, the panel has made the following suggestions regarding dosages of brachytherapy for palliation. For highdose-rate brachytherapy, total doses ranging from 15 to 47 Gy in one to five fractions calculated at 1.0 cm have been reported. Highdose-rate series in 1,299 patients showed symptomatic improvement ranging from 50% to 99% The ABS suggests 3 weekly fractions of 7.5 Gy each, two fractions of 10 Gy each, or four fractions of 6 Gy each (prescribed at 1.0 cm) when highdose-rate therapy is used as a sole modality for palliation (category 2). These fractionation regimens have similar radiobiological equivalence using the linear quadratic model, and there is no evidence of the superiority of one regimen over the other. Practitioners should weigh the benefits of fewer bronchoscopic applications with the risks of higher dose per fraction. Additional treatments or doses higher than those suggested can be considered for unirradiated patients and for those who have received limited irradiation (category 2). Brachytherapy as a Boost: It should be recognized that the combination of brachytherapy and external-beam radiation therapy is not commonly used for palliative purposes. However, combined therapy can be used in cases where it is felt that prolonged palliation is achievable (category 2). Two fractions of 7.5 Gy each, three fractions of 5 Gy each, or four fractions of 4 Gy each (prescribed at 1.0 cm) should be given when highdose-rate therapy is used as a planned boost to supplement palliative external-beam radiation therapy of 30 Gy in 10 to 12 fractions, when patients have no previous history of radiation treatment to the chest (category 2). The interval between fractions is generally 1 to 2 weeks. The brachytherapy dose should be reduced when aggressive chemotherapy is given. Concomitant chemotherapy should be avoided during brachytherapy, unless it is in the context of a clinical trial. The ABS suggests a high dose rate of three fractions of 5 Gy each or two fractions of 7.5 Gy each as a boost to external-beam radiation given as 60 Gy in 30 fractions or to 45 Gy in 15 fractions (category 2). The highdose-rate dose should be prescribed at a distance of 1.0 cm from the central axis of the catheter and given weekly. If endobronchial brachytherapy is used alone (in previously unirradiated patients), doses of five fractions of 5 Gy each or three fractions of 7.5 Gy each prescribed to 1 cm can be used (category 2). The role of high-dose-rate brachytherapy in the palliation of symptoms in patients with non-small-cell lung cancer: a systematic review. Ung YC, Lung Cancer Disease Site Group Of Cancer Care Ontario's Program In Evidence-Based Care. Brachytherapy. 2006 Jul-Sep;5(3):189-202. PURPOSE: This review addresses the role of high-dose-rate endobronchial brachytherapy (HDREB) for symptom palliation in patients with non-small-cell lung cancer. METHODS AND MATERIALS: Relevant trials were identified through a systematic search of the literature. RESULTS: Twenty-nine trials were eligible. 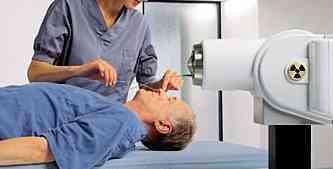 Six randomized trials involved HDREB alone or with external beam radiation therapy (EBR) or laser therapy. Median and 1-year survival ranged from 4 to 10 months and from 11% to 38%, respectively. Symptoms controlled by HDREB were dyspnea, cough, chest pain, and hemoptysis. Fatal hemoptysis ranged from 7% to 22%. Better overall symptom palliation and fewer retreatments were required in previously untreated patients using EBR alone or EBR with HDREB. CONCLUSIONS: EBR alone is more effective than HDREB for symptom palliation in previously untreated patients with endobronchial non-small-cell lung cancer. HDREB with EBR seems to provide better symptom relief than EBR alone. HDREB is recommended for symptomatic patients with recurrent endobronchial obstruction previously treated by EBR, providing it is technically feasible. Macha HN, Abteilung fur Pneumologie, der Lungenklinik Hemer. Pneumologie. 2005 Jan;59(1):12-7. To evaluate the impact of palliative high dose rate brachytherapy on survival and a pattern of failure, we performed a matched pair study. 94 patients with tumor recurrence after external beam radiation received endobronchial brachytherapy. They were followed prospectively and matched retrospectively with 94 comparable patients who had not received brachytherapy. Matched parameters were age, gender, smoking behaviour, histology, tumor stage, EBRT-dose and fractionation. The leading cause of death in both groups was generalized tumor growth. In the combined therapy group, fatal hemorrage was 27.7 %, two and a half times higher than in the EBRT group with 10.6 %, whereas respiratory insufficiency in the brachytherapy group was 6.4 % and 11.7 % in the EBRT group. A complete remission after brachytherapy yielded a 10.5 months longer mean survival. Patients dying from fatal hemorrhage after endobronchial brachytherapy lived on average 10.2 months longer than matched EBRT patients dying from the same cause. Analyzing the time-course of fatal hemorrage in the brachytherapy group we conclude that - because of its early onset in the first 10 months after induction of therapy roughly 20 % of the deaths can be attributed to a radiation damage. In those patients who died after 10 months the major cause of fatal hemorrhage was the natural course of sqamous cell carcinoma with prolonged survival. Endobronchial brachytherapy and optimization of local disease control in medically inoperable non-small cell lung carcinoma: a matched-pair analysis. PURPOSE: External beam radiation therapy (EBRT) alone for early stage, medically inoperable non-small cell lung cancer (MILC) can produce local disease control and sometimes cure. We have previously reported that higher EBRT doses result in improved disease control and, for patients with tumors > or =3.0 cm, improved survival. This report describes the impact of dose escalation with endobronchial brachytherapy boost during or following EBRT upon local disease control. METHODS AND MATERIALS: Medical records of 404 patients with MILC treated with radiotherapy alone were reviewed. Thirty-nine patients received a planned endobronchial brachytherapy boost during or following a course of EBRT. A matched-pair analysis of disease control and survival was performed by matching each brachytherapy patient to 2 EBRT patients from a reference group of the remaining patients. RESULTS: Endobronchial brachytherapy boost significantly improved local disease control over EBRT alone (58% vs. 32% at 5 years). The local control benefit for brachytherapy was found to be limited to patients with T(1-2) disease or tumors < or =5.0 cm. Among these patients treated with endobronchial boost, EBRT doses of > or =6500 cGy were necessary to optimize local disease control. No overall survival differences were observed at 3 years. Excess toxicity with brachytherapy was not observed. CONCLUSION: Endobronchial brachytherapy boost enhances local disease control rates in MILC treated with EBRT. Local control outcome is optimized when radical EBRT doses are used in conjunction with brachytherapy. Intraluminal brachytherapy for malignant endobronchial tumors: an update on low-dose rate versus high-dose rate radiation therapy. Lo TC, Department of Radiation Oncology, Lahey Clinic Medical Center, Clin Lung Cancer. 2001 Aug;3(1):65-8; discussion 69-70. Although the evolution from low-dose rate (LDR) to high-dose rate (HDR) brachytherapy for malignant endobronchial tumors was presumably based on economy, patient convenience, and radiation protection, our experience with both modalities permits assessment of the pros and cons of each technique. In November 1991, our HDR remote afterloading brachytherapy unit became operational. By that time, we had treated 110 patients (group 1) with malignant endobronchial obstruction with LDR brachytherapy. Since then, all patients have been treated with HDR brachytherapy. The outcome of our first 110 patients (group 2) treated with HDR brachytherapy is presented in this communication, using group 1 as the historic control group. In group 1, patients were treated with 1 or 2 sessions of 30-60 Gy, each calculated at a 1-cm radius. In group 2, patients received 3 or 4 weekly treatments of 7 Gy, each calculated at a 1-cm radius. The majority of patients in each group had previously received a full course of external beam irradiation, and a history of laser bronchoscopy was also similar for the 2 groups. Differences in bronchoscopic response rate (82% vs. 96%, respectively) and complications (3.6% vs. 2.7%, respectively) were statistically insignificant between the LDR group and the HDR group. We believe HDR brachytherapy is the state-of-the-art modality in intraluminal therapy for endobronchial malignancies. Materials and Methods: All patients treated with EHDRB since Jan. 1991, with a minimum follow-up of 1 year or until death were included. A total of 67 consecutively treated patients were analyzed in this retrospective study: 51 men and 16 women (median age: 62.5 years, range: 29-78 years). Patients with endobronchial lung primaries or metastatic tumors were treated and classified to 3 groups: curative (boost after external irradiation or brachytherapy alone), palliative and recurrences (with or without external radiation). The standard EHDRB treatment protocol included 3 fractions of 7.5Gy each, calculated at 1cm or less from the source axis (with �optimization on dose points�) at weekly or fortnightly intervals. When indicated, external beam irradiation was performed either in a standard basis of 60Gy (30 x 2Gy) for curative cases, or 30Gy (10 x 3Gy) in recurrent/palliative situations. The following clinical parameters were analyzed: age, performance status, histology, stage, association with previous lasertherapy, external beam radiotherapy and chemotherapy, intent of therapy, endobronchial tumor location and survival after EHDRB. Technical parameters analyzed included: total dose and dose/fraction of EHDRB, the 100% isodose volume (V100), and the ratio between the high dose volumes (150% and 200% isodoses) and V100 (V150/100 and V200/100, respectively). Statistical analysis used the occurrence of FH as the endpoint. Influence of parameters was studied by uni- and multivariate analyses. Results: A total of 201 EHDRB procedures were performed with a total dose range from 12.5 to 37.5Gy (median: 22.5Gy) in 5 to 7.5Gy/fraction. Median survival was 6 months. Seven (10.4%) patients died of FH at a median interval of 4 months (1 to 8 months). Among all parameters evaluated, only V100 was marginally selected as a risk factor for FH on univariate analysis (p < 0.09). Patients with FH had a mean V100 of 37.4cm3 and the others 24.9cm3. Multivariate analysis showed a significant correlation between FH and V100 (p < 0.03), and a trend towards tumor location (p < 0.06) for lesions located in the left bronchial tree (main bronchus and superior lobe or lingula). Conclusion: In this study, the total irradiated volume at prescribed dose (V100) was a risk factor for FH. The higher incidence in left bronchial lesions may probably be related to proximity to the major mediastinal vasculature. Although the small number of patients limited the accuracy of the model, we recommend careful patient selection for the procedure, especially in cases where life expectancy is greater than 3 months, lesions of the proximal left bronchial tree and/or when the intended EHDRB treatment volume exceeds 30cm3. The use of high dose rate endobronchial brachytherapy to palliate symptomatic endobronchial recurrence of previously irradiated bronchogenic carcinoma. Bedwinek. Thirty-eight patients were treated with high dose rate endobronchial brachytherapy to palliate symptoms (cough, hemoptysis, fever, and/or shortness of breath) caused by endobronchial of previously irradiated (greater than or equal to 5000 cGy) bronchogenic carcinoma. The dose per fraction was 600 cGy at a radius of 1 cm from the center of the linear path of the source, and each patient received three fraction, each fraction separated by a 1-week interval. Twenty-nine patients (76%) had symptomatic improvement, 16 with complete and 13 with partial relief of symptoms.The median duration of symptom relief was 7.5 months. Repeat bronchoscopy done 3 months after brachytherapy revealed that 41% (11/27) had complete tumor regression and another 41% (11/27) had partial regression. Twelve patients (32%) died from massive hemoptysis occurring 2-56 weeks (median 10 weeks) after brachytherapy. Endobronchial brachytherapy with high-dose-rate remote afterloading for recurrent endobronchial lesions. Delclos. 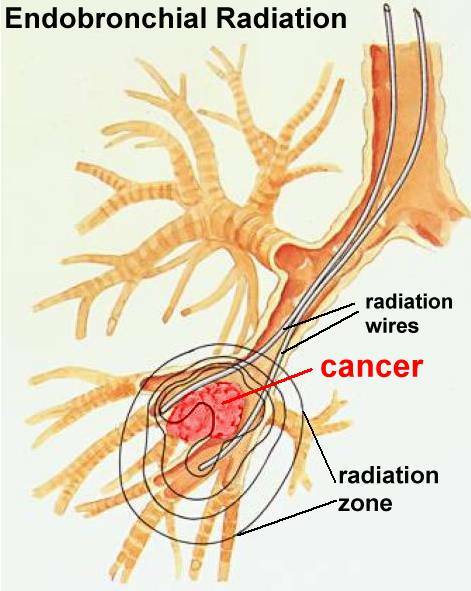 From 1988 to 1993, 81 patients with lung cancer previously treated with external beam radiation therapy were treated with palliative HDR endobronchial brachytherapy for symptoms due to relapse or persistent tumor of endobronchial bronchogenic origin. For most patients, Ir-192 was delivered in a dose of 3,000 cGy at 6 mm in two fractions over 2 weeks. RESULTS: Sixty-eight patients (84%) achieved some response: Twenty-six (32%) had excellent, 25 (31%) had moderate, and 17 (21%) had minimal symptomatic improvement with HDR endobronchial brachytherapy. The median duration of responses was 4.5 months. Those patients with an excellent response had a significantly better survival (13.3 months) compared with that of the other patients (5.4 months) (P = .01). There were two fatal complications, which were due to fistula and tracheal malacia. Gauwitz. 24 patients with endobronchial tumors that had recurred after external beam radiation therapy were treated with high dose rate intraluminal irradiation. A remote afterloading high dose rate unit was used, and most patients received two endobronchial treatments, separated by a two week interval. At each treatment, 15 Gy were delivered with dose specified at a radius of 6 mm from the center of the source, which corresponds to a dose of 9 Gy at a radius of 1 cm. Overall, 21 of 24 patients (88%) showed good symptomatic improvement. Of 18 patients whose chest x-ray showed evidence of collapse or atelectasis caused by tumor obstruction, 15 (83%) had evidence of reaeration. The median duration of palliation, marked by symptoms or a chest x-ray that worsened, was 26 weeks, the range varying from seven to 40 weeks. No patient died as a result of therapy and only one had a complication, bronchospasm, which responded well to bronchodilators. Hernandez. A prospective cohort of 29 patients (19 men, mean age 65 years) underwent HDR brachytherapy for inoperable lung cancer. All patients had completed external irradiation at least one month before entry into the study dose 4400 cGy, completed 12.9 months previously. Patients underwent outpatient bronchoscopic placement of 1-3 HDR brachytherapy catheters for delivery of 750-1000 cGy of intraluminal irradiation every two weeks on 1-3 occasions. Positive response rates ranged from 25% for signs and symptoms related to pneumonitis to 69% for haemoptysis. Performance status improved in 24% of patients. Two patients died before completion of the study protocol. Short term complications included one episode of non-fatal, massive haemoptysis, five of minor haemoptysis, and one pneumothorax. High dose-rate intraluminal irradiation in bronchogenic carcinoma. Technique and results. Nori. In this series, we report on 80 high dose-rate endobronchial treatments in 32 patients who were treated with remote afterloading endobronchial irradiation. All patients had endoscopic and histologic proof of tumor. Patients were divided into two groups. Group 1 consisted of 17 patients who were treated with endobronchial brachytherapy as a boost to primary external-beam irradiation. The remaining 15 patients comprised group 2 and were treated for endobronchial recurrence after prior irradiation with an external beam (main dose, 5,000 cGy). The endobronchial irradiation treatments were delivered using a high dose-rate remote afterloader. The standard dose per fraction was 500 cGy prescribed at a distance of 1 cm from the central axis of the catheter for a median of 3 fractions at weekly intervals. Treatment length averaged 5 cm; the median total dose was 1,500 cGy. The median follow-up for the entire group was 9.3 months, with a range of 6 to 24 months. Symptomatic improvement was attained in 15 of 15 patients presenting with hemoptysis, in 6 of 7 of those with cough, and in 10 of 10 who presented with dyspnea. In ten patients, follow-up endoscopy was performed, which revealed a pathologic complete response (by negative results on biopsies). At 6 months past the last brachytherapy, clinical and radiographic local control was obtained in 15/17 (88 percent) of the patients in group 1 and in 70 percent of the patients in group 2. All patients tolerated treatment well, without any acute or late complications, and there were no instances of fistula formation or fatal pulmonary hemorrhage. Defining the roles of high dose rate endobronchial brachytherapy and laser resection for recurrent bronchial malignancy. Ornadel. We have undertaken a prospective analysis of symptom response, duration of response, and prognostic factors for 117 patients treated with brachytherapy at a single centre, to identify hypotheses suitable for prospective randomised studies. All but one patient had received previous treatment. The percentage of patients with scores of 0 or 1 (none or mild) for each symptom pre-treatment and at 3 months were as follows: cough 62% to 77% (43% improving by at least one grade, N.S. ); dyspnoea 32% to 56% (50% improvement by at least one grade, P = 0.0063); haemoptysis 78% to 97%; performance status 65% to 84% (54% by at least one grade, P = 0.0417). An actuarial risk of fatal haemoptysis at 2 years of 20% was associated with prior laser resection (P = 0.048). Curative irradiation of limited endobronchial carcinomas with high-dose rate brachytherapy. Results of a pilot study. Perol. Pilot study to assess high-dose rate (HDR) brachytherapy as sole treatment for limited endobronchial non-small cell lung carcinomas. INCLUSION CRITERIA: Proximal non-small cell lung cancer in a not previously irradiated area, with a maximal diameter of 1 cm, no visible tumor on CT scan, lack of other treatment options in patients with severe, chronic respiratory failure, surgery, or external radiotherapy for a previous lung cancer. TREATMENT PROTOCOL: Treatment was based on an escalating dose protocol. Patients received three to five fractions of 7 Gy prescribed at 10 mm from the center of the applicator, once a week. RESULTS: Nineteen patients were included in this trial. The first two patients received three fractions of 7 Gy, the four next patients received four fractions, and the 13 remaining patients were treated with five fractions of 7 Gy. Two months after the end of the procedure, tumors in 15 of 18 evaluable patients (83%) were locally controlled with negative results of biopsies. At 1 year, local control was still obtained in 12 of 16 evaluable patients (75%). With a mean follow-up of 28-months, 1-year and 2-year actuarial survival rates were 78% and 58%, respectively, with a 28-month median survival. One patient with local control died from hemoptysis 12 months after treatment. Two patients suffered from severe necrosis of the bronchial wall; one of them died from hemoptysis. Speiser. Patients with endobronchial carcinoma were treated on a protocol (n = 342) with remote afterloading brachytherapy. Group 1 patients were treated with medium dose rate and received 1000 cGy at 5 mm depth for three fractions (n = 47). Group 2 were treated with high dose rate, 1000 cGy to a 10 mm depth for three fractions (n = 144) and Group 3 received 750 cGy delivered to a 10 mm depth for three fractions (n = 151). Each group was divided into curative, palliative, and recurrent categories. Evaluation consisted of symptom index scoring with weighted responses of hemoptysis 99%, obstructive pneumonia 99%, cough 85%, and dyspnea 86%. Obstruction improvement was 80% overall, curative 87%, palliative 84%, and recurrent 70% of mean pretreatment scores. Survival 10% alive, 88% expired, and 2% lost to follow-up. Cause of death was intrathoracic carcinoma 41%, metastatic carcinoma 38%, intercurrent disease 9%, and unknown cause 13%. Survival from diagnosis and first treatment was, respectively, for curative 10.8 and 9.5 months, palliative 14 and 5.6 months, and recurrent 25.6 and 6.2 months. Significant complications were fatal hemoptysis 7%, and radiation bronchitis and stenosis 11%. High dose rate endobronchial brachytherapy: results and complications in 189 patients. Taulelle 189 patients with bronchogenic carcinoma were treated with high dose rate endobronchial brachytherapy. Most patients (69.3%) had received prior treatment and presented with symptomatic bronchial obstruction due to either recurrent or residual endobronchial disease. A small group (12%) was medically unfit for either surgical resection or thoracic radiotherapy and benefited from endobronchial brachytherapy alone for small endobronchial tumours. Treatment was performed weekly and consisted of three to four 8 to 10 Gy fractions at a radius of 10 mm from the centre of the source. Major symptomatic relief was obtained for haemoptysis (74%), dyspnoea (54%), and cough (54%). Complete endoscopic response was observed in 54% of cases. Median survival was 7 months for the entire group. For small, strictly endobronchial tumours, complete response rate was 96%, median survival 17 months, and 30 month survival 46%, with a plateau starting at 18 months. Grade 3 to 4 toxicities occurred at a rate of 17% and included massive haemoptysis (n=13), bronchial stenosis (n=12), soft tissue necrosis (n=8), and bronchial fistula (n=3). High-dose-rate intraluminal brachytherapy in the treatment of endobronchial malignancy. Work in progress. Zajac. Remote afterloading high-dose-rate brachytherapy (RAHDRB) was used endobronchially for the management of malignant airway obstruction in 82 patients, 72 of whom had primary disease in the lung. Treatment was palliative (n = 58) or definitive (n = 24). The extent of airway compromise was determined at bronchoscopy and with symptoms of hemoptysis, dyspnea, or cough or with radiographic evidence of atelectasis. RAHDRB doses were 1,000-4,700 cGy in one to five fractions. External beam radiation was used in previously unirradiated patients. A substantial reduction ,N airway disease and an improvement in symptoms were seen in 82% of patients. Obstruction scores showed an overall 74% improvement. Complications occurred in only 10 patients (two of whom died). Median survival was short (palliative group, 5 months; definitive group, 12 months); however, symptoms remained palliated in 62 patients (76%) until death or the last follow-up examination.